A young girl called Mouche is about to throw herself into the Seine, when her attention is attracted by a voice. It turns out to be the voice of a glove puppet, called Carrot Top. She then meets Reynard the fox, Gigi, Alifanfaron, Dr Duclos, Madame Muscat and Monsieur Nicholas. The story is about her relationship with the seven puppets and their grim puppetmaster, Capitaine Coq, and what happens when she joins their travelling show. This is another of Paul Gallico's brilliant short novels. You find yourself thinking, as Mouche does, of the puppets as individuals, and completely forgetting that they are only puppets. 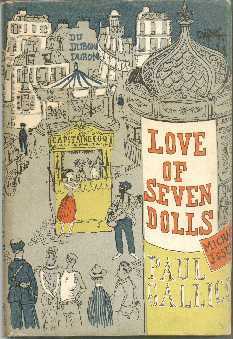 An earlier version of Love of Seven Dolls first appeared in The Saturday Evening Post in October 1950, called The Man Who Hated People. This story was the inspiration for the film Lili, starring Leslie Caron, and also for the musical Carnival! 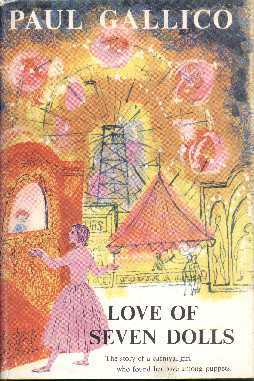 Interestingly, Lili came out in 1953, before Love of Seven Dolls was published, but it is clear that the film is definitely based on Love of Seven Dolls and not the earlier The Man Who Hated People. It seems clear that MGM and Helen Deutsch (who wrote the screenplay) must have been working in association with Gallico. The book is still in print in both the UK and the US, though no longer available as a Penguin paperback in Britain. Second hand copies of the original hardback are fairly easy to find.